The Maldives are one of the most popular destinations on the globe for people that want to be surrounded by exceptional beaches that are complimented by fantastically stunning water. Cnn Travel agrees, as it ranked one of the beaches in the Maldives at number 25 in its list of the 100 best beaches around the world. 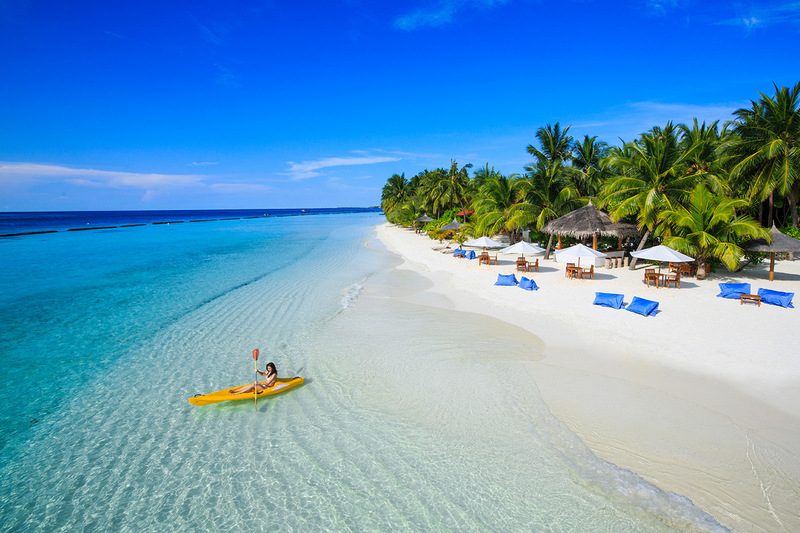 Popular travel agent FlightNetwork listed two beaches on Maldive islands in its list of The World’s 50 Best Beaches, which proves even further what an admired place it is, and why so many people want to go on holidays to the Maldives. All of the hype that it gets, it should be of no surprise that the Maldives has seen a boom in tourism since the 1970s, when there was a mere two resorts that combined had 280 beds. That number then grew to roughly 90 in 2007, and today there are over 120 resorts spread across the archipelagos islands. Everything from 5 star all inclusive to cheap all inclusive resorts are offered, as well as everything in between. You can stay in an adult only resort, or a family-friendly hotel. You can even stay in specialized accommodations, like a spa resort, or a diving and snorkeling resort. The world is one’s oyster when it comes to places to stay in the Maldives. So much so that choosing what Maldives hotel to stay in can often be a hard decision to make. So we have made things a little bit easier. These are our top 10 hotels in the Maldives. As if the stunning beach and crystal clear blue ocean wasn’t enough, Soneva Fushi pushed the mark even further with its observatory and open-air cinema to go with the treetop restaurants, chilled chocolate room, and wine cellar stocked with 7,000 bottles of the finest wines on earth. Let’s not forget about its private butlers, private art gallery, and award-winning dining experiences. But you wouldn’t expect anything less from former Six Senses owners Sonu and Eva, who have brought a Six Senses Spa into the mix. The philosophy behind the Soneva Fushi is ‘no news, no shoes’, so it is basically barefoot luxury with all of the trimmings. There are nine villa options to choose from, some of which have their very own private wine cellar, and others that boast a private pool. All villas are set right on the magnificent white sandy beach with a lush jungle backdrop, and feature an open-air garden bathroom and an outdoor sitting area. There are small one-bedroom villas and larger three-bedroom villas that have bedrooms on the second floor. The Soneva Fushi also has four- and six-bedroom residences, complete with a private spa, a gym, and a separate swimming pool for the kids. For the ultimate privacy, stay in the nine-bedroom private reserve. Click here to see more photos and book Soneva Fushi. Located in the phenomenal Baa Atoll UNESCO Biosphere Reserve, you can expect nothing short of perfect when staying at this magnificent resort. Staying at The Four Seasons Maldives at Landaa Giraavaru is like escaping reality, as that is how you will feel the minute you get out of the private seaplane. Built on a former coconut plantation, this sophisticated property prides itself on its sustainable luxury living. 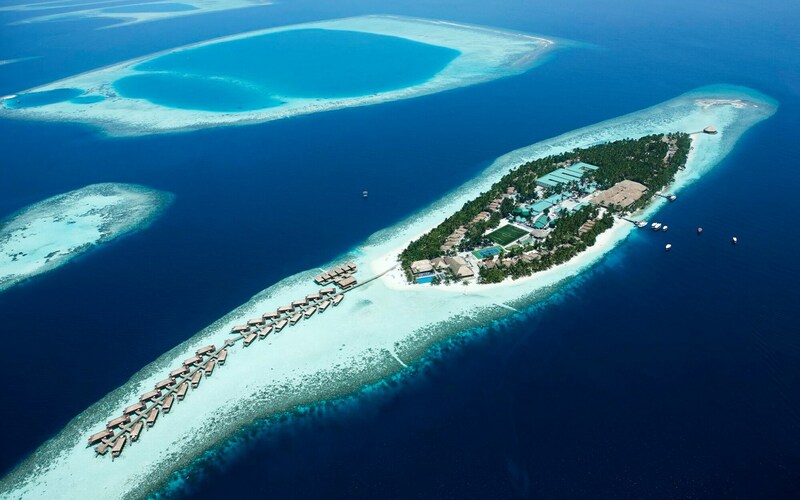 The resort also helps with marine life preservation by having its very own Maldivian Manta Ray Project. There is even a Marine Discovery Centre on-site, or you can get even closer to the amazing marine life by going scuba diving with its team of incredible instructors. The Four Seasons Maldives at Landaa Giraavaru features an incredible Ayurveda spa, a selection of fantastic restaurants, and a shisha bar. Guests can even dine right in their villa, all of which have their own private outdoor seating area. The regular one- and two-bedroom villas sit right over the water, with some also boasting a private pool. There are also specialty suites that can sleep as many as ten people, all of which feature a pool complete with a large deck, a lounge area, and a dining area. If that isn’t enough, opt for the ultimate in beachside escape by staying in the 8,611 square Landaa Estate. Click here to book Four Seasons Maldives at Landaa Giraavaru. Priding itself for being the first ever private resort in the archipelago, Kurumba Maldives is a cosmopolitan resort that offers guests a traditional Maldivian experience. What started as a small resort that could only accommodate 60 guests has grown to be one of the top hotels in the Maldives, offering offers rooms, suites, and villas. There is even the beachfront Royal Residence that boasts two private pools, two private gazebos, and an outdoor shower. Guests staying in this eight person villa will get spoiled even further by having 24-hour butler service. Those wanting something a little less grandeur will still feel as if they are VIP guests in the Superior Room, which is set right on the beach. In fact, almost every accommodation option at Kurumba Maldives opens up to the beach. The rest of the property matches the intricacy in which the rooms and villas were designed, right down to exceptional details in the restaurant’s décor, which matches the exquisiteness of the food. 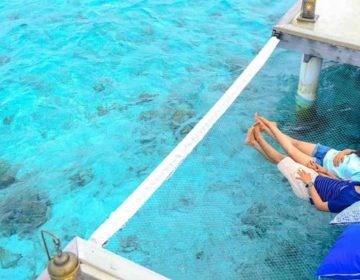 Full board, half board, and Maldives all inclusive holidays are all offered at this family-friendly resort, which is also popular amongst honeymooners. In fact, they offer a Romantic Getaway Package that includes a Balinese massage and a Sunset & Dolphin Discovery Cruise. The resort also offers tours around the island in a glass-bottom boat, snorkeling safaris, and fishing trips. Or stay onsite and go surfing, jet skiing, waterskiing, canoeing, and more. For photos and to book Kurumba Maldives, click here. The Filitheyo Island Resort is proof that you don’t have to break the bank to have an exceptional time while on holidays to the Maldives. In fact, it is just a fraction of the cost of most of the other top 10 hotels in the Maldives, yet just as magnificent. This cozy barefoot retreat is surrounded by some of the most stunning reefs of all Maldives islands, making it a top choice for snorkelers and divers. It also offers numerous other watersports, as well as boasting an outstanding spa that is surrounded by lush greenery. If that’s not enough, the restaurant serves an excellent spread of cuisine from around the world. Those on a romantic getaway can enjoy the peace and quiet of the adult only Water Villas, which are stilted right over the ocean and offer a secluded wonderland away from all of life’s stresses. Families are also welcome at the resort, with the Deluxe and Superior Villas being spacious enough for everyone. These open up right onto the beach and feature an outdoor bathroom. They truly are the barefoot luxury that many people dream of when they think about Maldives holidays. Whether you are a family or a couple on a honeymoon, the Filitheyo Island Resort is sure to tick all of your boxes. Click here to book a villa at Filitheyo Island Resort. Transfer time: 40 minutes from Malé by seaplane. You can’t list the top 10 hotels in the Maldives without mentioning the Six Senses Laamu, as it sets itself apart from the rest; literally, by being the only resort in the Laamu Atoll. It truly is a fine example of the essence of barefoot luxury, from its first rate spa right down to its over-water villas. On top of that, everything at the resort was built using sustainable materials. This is taken one step further with the organic gardens that grow the restaurants’ supply of produce. There are six restaurants and bars to choose from, most of which are set right over the water. One thing that you can be sure of is that all meals are made with the utmost perfection and menus were designed by exceptional chefs. Children are welcome at the Six Senses Laamu, with most families staying in the Family Beach Villas with Pool. These villas face the sea and feature a wonderful treetop deck complete with a seating and dining area. The Family Beach Villas are set away from the other villas to allow couples the quiet time that they crave while staying in a villa on the beach, in the forest, or right above the water. Guests wanting the ultimate privacy will find the Water Villas suite them best, which sit at the far end of the resort. What more, they feature a glass overwater bathtub, an outdoor rain shower, and a private deck where they can dangle their feet right over the water. Click here for current deals at Six Senses Laamu. This is an excellent example of how you can have a fantastic cheap Maldives holiday. This budget-friendly hotel is just steps away from Kandooma Beach and offers a relaxing environment, and an authentic Maldivian experience. Guraidhoo is one of the inhabited islands in the Maldives, which means staying here means that guests can get a true feeling of what the local culture and life is really all about. This is something unique of Coco Cottage Maldives that the other top Maldives hotels don’t offer. Here, guests can be tourists by enjoying the beach and its water sports, and they can also mingle with the locals in the nearby village. There are three room options to choose from, all of which have free WiFi and air-conditioning. Room service is available from the hotel’s great rooftop restaurant, which also offers packed lunches for guests going on day trips. The staff is very friendly and offer to help guests with anything that they may need, be it to book an excursion or to borrow fishing equipment. For something really special, the Coco Cottage Maldives offers picnics to one of the small uninhabited islands in the atoll. This tropical paradise is split into two areas; one for families and one child free area (18 and over). This means that it is perfect for couples wanting to enjoy a romantic holiday in the Maldives, and for families wanting to spend time on the beach or at the designated family pool. Vilamendhoo Island Resort and Spa features a true re-charge and rejuvenate experience with its spa specializing in healing traditions from Africa and Asia. It also has two fantastic restaurants, four bars, and offers private dining on the beach. All meals are included at this full board resort, or go the extra mile and enjoy the all-inclusive package, which includes all beverages – alcoholic and non-alcoholic. For the most luxurious stay at the Vilamendhoo Island Resort & Spa, stay in one of the Jacuzzi Water Villas, which are set right over the water. They also boast a private walled-in outdoor area with a Jacuzzi and a private sundeck with stairs into the sea. Guests that would rather stay on the beach should opt for the Jacuzzi Beach Villas or the Beach Villas, which are the same minus the Jacuzzi and private sundeck. All villas at the resort are impeccably designed with a minimalist style and feature a partially open-air bathroom, a rain shower, and 32 inch flat screen cable TV. For more photos or to book Vilamendhoo Island Resort & Spa, click here. The largest resort in the entire archipelago, the Shangri-La’s Villingili Resort & Spa is even in its very own time zone, so it is the ultimate disconnect from reality. The minute you arrive at this extravagant hideaway you will be in awe thanks to the immaculate white sand beach and thousands of coconut palms swaying in the wind. This is matched by the backdrop of Mount Villingili, with some of the resort’s villas being nestled right into it. Others sit atop the stunning clear blue water or right along the picture perfect beach. Villas have a chic design that flawlessly mix elements of Indian and Middle Eastern design. They are the perfect place for couples and families to escape. Dip your feet into the sea right from your water villa, or enjoy swimming in the privacy of your own pool. There is also a large swimming pool, tennis courts, a health club, and water sports. If that is not enough to keep you busy, then head to the resort’s very own nine-hole golf course. The Shangri-La’s Villingili Resort & Spa of course has a tranquil spa that specializes in Indian Ayurvedic treatments, as well as offering yoga classes in a pavilion overlooking the ocean. Days are finished off with sunset cocktails at the trendy beachfront M Lounge, followed by succulent meals that are prepared by top rated chefs. Click here for the best deals at Shangri-La’s Villingili Resort & Spa. Transfer time: a scenic 70-minute flight from Malé International Airport to Gan International Airport, followed by a 5 minute private boat ride. True to the Taj name, the Taj Exotica Maldives is fit for a maharaja, or a queen. The extremely thin island is dotted with jade trees, swaying palms, and sea hibiscus, with villas either along the beach or floating on stilts above the magnificently clear water. Surrounding this small Maldives island is some stunning coral reefs, creating a picture perfect setting for forgetting about regular life and enjoying total bliss. This is what holidays in the Maldives are all about, and it would not be complete without the food artistry that is offered by Chef Sheroy Kermani at 24 Degrees, or without sipping fine wine and smoking a cigar at the stylish contemporary Equator Bar. Let’s not forget about the customized services and 24-hour private butler service. The Jiva Spa offers an eclectic mix of treatments, from traditional Indian therapies to refreshing beauty treatments. The spa would not be complete without customized private yoga classes that are set against the beautiful backdrop of the resort’s architecture and landscape. It is a great way to spend the morning after enjoying a coffee and listening to the ocean right from your villa, which are either right on the beach or on the water. Choose a villa that offers spectacular views of the sunrise or the sunset, all of which just add to the entire tranquility that the Taj Exotica radiates. 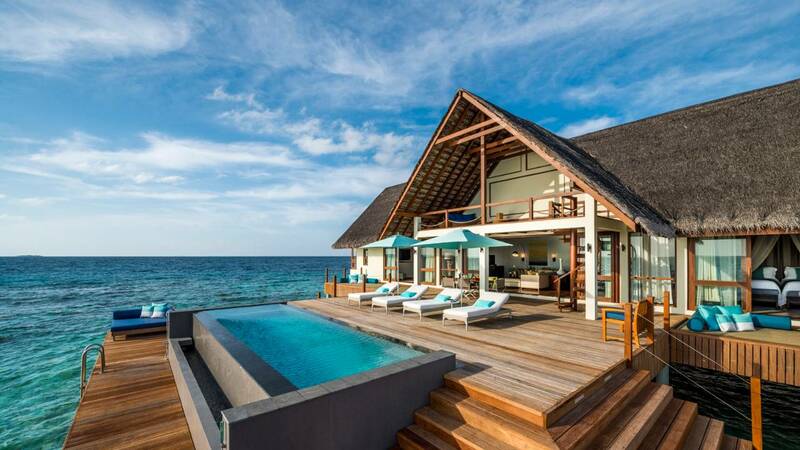 Click here to book a villa at Taj Exotica Maldives. This private island retreat is the perfect blend of peacefulness and excitement, stimulating all of the five senses. 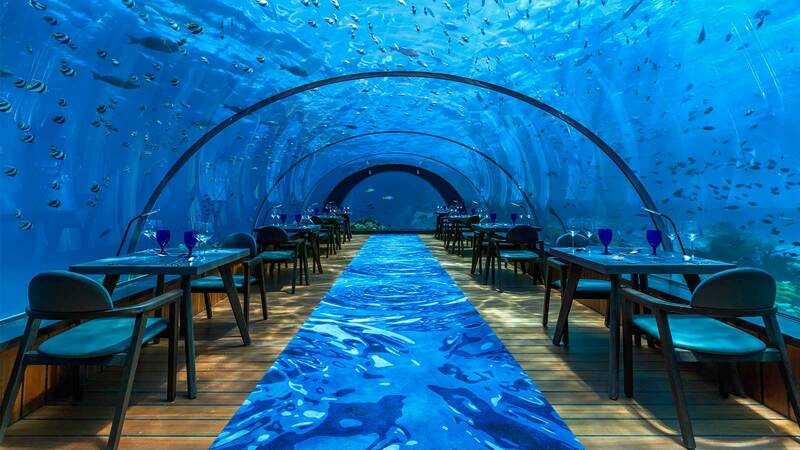 What sets the Hurawalhi Island Resort apart from all on the other hotels in the Maldives is that it is home to the world’s largest underwater restaurant. You will be in gastronomical heaven in the phenomenal 5.8 Undersea Restaurant, which, as its name suggests, is submerged 5.8 meters (19 feet) under water. The food is as exceptional as the surroundings, while the other restaurants are also nothing short of splendid. 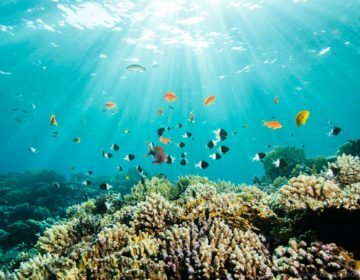 You can also get close to the magnificent marine life by going snorkeling right from the beach, or enjoying a day of scuba diving. Guests that would rather stay dry can get pampered at the spa, or enjoy the onsite Hurawalhi’s Sports Ground. The villas match the perfection of the rest of the property, complete with spectacular views of the ocean. The over-the-water villas bring the ocean right to your doorstep, while the beach front villas leave you just a few mere steps away. The majority of the villas boast their very own private plunge pool, while the Romantic Ocean Villa also has an outdoor bathtub. No matter what villa you stay in, you will be sure to experience the ultimate of Maldive holidays, as they all offer complete privacy and ooze luxury, right down to the finest details. See current deals on villas at Hurawalhi Island Resort here. 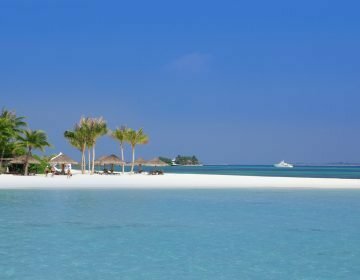 Next Article When is the Best Time To Go to the Maldives?